A TIMS is an instrument that measures isotopic ratios that are used in geochemistry, geochronology, and cosmochemistry. A TIMS is a magnetic sector mass spectrometer that is capable of making very precise measurements of isotope ratios of elements that can be ionized thermally, usually by passing a current through a thin metal ribbon or ribbons under vacuum. The ions created on the ribbon(s) are accelerated across an electrical potential gradient (up to 10 KV) and focused into a beam via a series of slits and electrostatically charged plates. This ion beam then passes through a magnetic field and the original ion beam is dispersed into separate beams on the basis of their mass to charge ratio. These mass-resolved beams are then directed into collectors where the ion beam is converted into voltage. Comparison of voltages corresponding to individual ion beams yield precise isotope ratios. Thermal Ionization Mass Spectrometry (TIMS) Instrumentation - How Does It Work? Modern instruments are composed of three primary components: 1) ion source, the region in which ions are produced, accelerated, and focused; 2) analyzer, the region in which the beam is separated based on mass/charge ratios; and 3) collector, a region in which the ion beams are measured either sequentially (single collector) or simultaneously (multi-collector). The electronics of these instruments must operate to very close tolerances in order to produce isotope ratios that are precise to 0.01-0.001%. The primary application of TIMS is to measure the isotope ratios of elements used in geochronology and tracer studies. Geochronology refers to the use of radioactive decay in closed systems to obtain the time of a specific geologic event, which is referred to as an age. Tracer applications refer to the use of the growth of daughter isotopes from radioactive decay to evaluate the interaction between geochemical systems and/or reservoirs. This application provides only general chronologic information, often referred to as model ages, which more loosely constrain the timing of geologic processes and the development of, and interaction between, geochemical reservoirs. Strengths and Limitations of Thermal Ionization Mass Spectrometry (TIMS)? near 100% transmission of ions from source to collector. accurate mass fractionation correction is limited to elements with 3 or more isotopes of which at least 2 are stable. As for all geochemical analyses, care must be taken to preserve sample integrity from the time of collection through analysis in all steps of physical and chemical preparation. 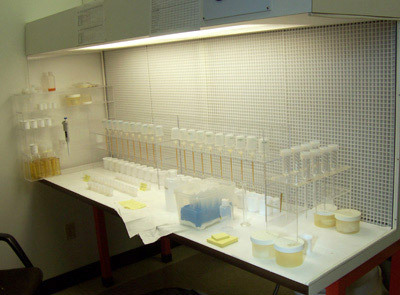 Most applications require complete dissolution of the sample followed by liquid chromatography to isolate elements of interest, which is usually done in a "clean" laboratory (typically Class 100-1000). For geochronologic and many tracer applications, it is necessary to "spike" samples with an artificially enriched isotopic tracer in order to determine concentrations and parent-daughter ratios by isotope dilution. Elements are loaded directly as acid solutions on pre-cleaned metal ribbons for analysis. Measured isotope ratios must be properly corrected for all instrumental biases, including mass fractionation. Once corrected, these ratios are suitable for plotting in any diagrams requiring atomic ratios (e.g., isochron, concordia, etc.) or for calculating model ages and initial isotopic ratios. For more information about Thermal Ionization Mass Spectrometry (TIMS) follow the links below. Thermal Ionization- this page, from the University of Arizona SAHRA program, offers a brief description of thermal ionization. Geochemistry of the World Wide Web- this site, from Cornell University, provides links to geochemistry-related websites, including professional societies, journals, on-line geochemical data, geochemical analytical standards, government and university laboratories, and cosmochemistry-, astronomy-, and planetology-related sites. 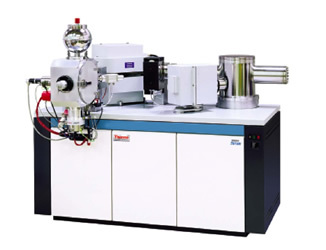 Mass Spectrometry Wiki- this Wiki site provides a brief description of thermal ionization. Thermo Scientific Corporation- this website provides details regarding the perchase of a Triton thermal ionization ratio MS with multicollector. Powerpoint tutorials on Mass Spectrometry from the EARTHTIME project. Teaching activities, labs, and resources pertaining to Thermal Ionization Mass Spectrometry (TIMS). Application of Sr Isotopic Data to Tuolumne Intrusive Series, Sierra Nevada, CA - In this problem set students are given Rb/Sr and 87Sr/86Sr data for whole rock and mineral samples from three granitic intrusions in the Sierra Nevada. They use these data (in EXCEL) to calculate isochron ages and initial ages for the intrusions and then interpret their results. This problem is intended to teach some spreadsheet skills (linear regressions, graphing) as well as having them think about the use of radiogenic isotopes. Rb-Sr isotope in-class exercise - This set of problems involves calculations of changes in radiogenic isotope ratios. It requires students to understand the concept of an isochron and how isotope ratios change (or do not change) during magma mixing and crystal fractionation.